The only Spanish missionary who was killed by Indians died at Mission San Diego de Alcala. 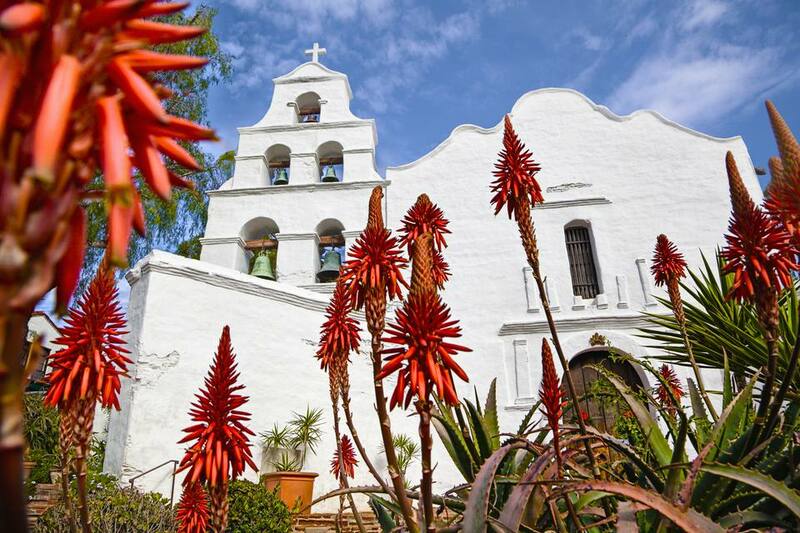 Where Is Mission San Diego Located? The mission's address is 10818 San Diego Mission Road, San Diego, CA. In March 1769, a party of 219 men called the Sacred Expedition, led by Father Junipero Serra and Don Gaspar de Portola, left Baja California, Mexico, to establish the first Spanish church in California. Two groups traveled, one by land and one by sea, meeting in July 1769, on a hillside above a wide bay. It was an arduous journey; almost half the men died, more were ill, and one ship was lost. Portola soon took Fathers Crespi and Gomez and the strongest men and left for Monterey Bay. Father Serra and the rest selected a site - at the base of a hill, beside a river, with a native American village on a nearby hilltop. On July 16, Father Serra celebrated the first mass beside a wooden cross. He named the Mission San Diego de Alcala in honor of Saint Didacus of Alcala, the name explorer Sebastian Vizcaino gave the bay 167 years before. The location seemed perfect, with plenty of water, pasture land for the cattle, and trees to provide wood for cooking and building. The soldiers had a good view of the bay and could see arrivals in plenty of time. However, the San Diego Mission did not have a smooth start. The natives, worried because they had seen many men sick and afraid that disease might spread to their village, refused to visit or be converted. On August 15, scarcely a month after the founding, the natives attacked. The soldiers killed or injured several of them, making them, even more, less likely to visit. Portola came back after six months to find the San Diego Mission in trouble. Little work was done, and supplies ran dangerously low. A ship sent to Mexico for supplies had not returned. Portola sent a group to Mexico by land and decided the settlement could last until mid-March before they had to return to Mexico. One day before Portola planned to leave, the ship San Antonio appeared with supplies. Portola soon left again to look for Monterey Bay. They struggled for the next five years. There was too much water or not enough, depending on the season. The soil was poor, and crops were small. The natives, afraid of the soldiers, still refused to come. Two priests returned to Mexico. Finally, Father Luis Jayme arrived and took charge, moving the mission to a place with fertile soil and fresh water, six miles upriver. Calling it Nuestra Senora de Pilar, they established a new site there in December 1774. With only four hand-picked guards at the new site, the natives began coming right away. By the end of the first year, there were more than 100 converts. The Kumeyaay village elders worried that their traditions were disappearing. When two escaped converts told of the mission's riches and how easy they would be to take, they decided to attack. Around midnight on November 5, 1775, some 800 natives approached. Father Jayme walked out with arms outstretched, saying: "Love God, my children." The natives stripped, beat and killed him and two others, burning all the buildings. The survivors fled to the Presidio, where they stayed for several months. Father Serra was at San Juan Capistrano and came back when he heard of the attack. Seven months later, governor Don Fernando de Rivera established order. They planned to rebuild, and a 12-man guard was sent to protect the builders. Some of the natives greeted the fathers and helped with the building. On October 16, 1776, the new church, built with high walls and deep foundations, was dedicated. San Diego Mission began to flourish. The natives never attacked again. Orchards and gardens produced food. Livestock multiplied. In 1780, the church was enlarged and built into the now-customary quadrangle. By 1787, there were 1,405 converts. In 1803, an earthquake destroyed the buildings. The priests started the present church building in 1808 and finished in 1813. A dam was built upstream in 1816. After Mexico won independence from Spain, the missions were secularized. The land was supposed to go to the natives, but most of it went to dishonest politicians and their friends. San Diego Mission was given to a Mexican, Santiago Arguello, in 1846. In 1847, the United States cavalry took over California and used the church for barracks and a stable. In 1862, the American government returned the lands to the Catholic church. By then, the building was weakened and decaying. In 1891, Father Antonio Ubach started raising money to restore it and started a school for native Californians. Unfortunately, Father Ubach died in 1907 without completing the restoration. In 1915, the city's mayor raised money to continue. The restoration of San Diego Mission was finished in 1931. In 1941, San Diego Mission once again became a parish church. In 1976 Pope Paul VI made it a Minor Basilica. The Mission San Diego picture above shows its cattle brand. It was drawn from samples on display at Mission San Francisco Solano and Mission San Antonio. After all the moving and earthquakes, construction of the current mission building began in 1808. This time, the fathers built for strength and permanence. Along with the mission building, they also rebuilt the irrigation system. They made a dam 3 miles above the mission and a tile aqueduct to carry water down to the mission. The new mission was dedicated on November 12, 1813, and the irrigation system was completed in 1816. The church is 135 feet long and 29 feet high. After secularization, the buildings deteriorated severely and a complete restoration was done in 1931. The front of the church was restored again in 1950.